With more than 250 yards on the ground and three touchdowns, junior running back Darrin Hall carried the Panthers football team to a 24-17 win at Duke — Pitt’s first ACC win of the season. Both the Pitt Panthers (3-5 overall, 1-3 ACC) and the Duke Blue Devils (4-4 overall, 1-4 ACC) were looking to snap extended losing streaks in their matchup on Saturday, but Hall’s big day and a late defensive stop propelled the Panthers over the top in a 24-17 win at Wallace Wade Stadium in Durham, North Carolina. Receiving the ball to start the game, the Blue Devils couldn’t get their offense moving and punted the ball away. The Panthers gained one first down, but then quickly punted the ball right back. After a second Blue Devils punt, Hall made Duke pay on the first play of the Panthers drive. Hall burst through a huge hole to the left and outran the Blue Devils’ secondary to score a 79-yard touchdown to put the Panthers on the board first, 7-0. The Blue Devils gained two quick first downs on their next drive, but at their 47-yard line, senior cornerback Avonte Maddox came around the edge and strip-sacked redshirt sophomore quarterback Daniel Jones. The Panthers recovered the ball, taking possession at Duke’s 37. After making no progress, the Panthers punted the ball right back. The Blue Devils found their stride offensively, but as they made their way into the red zone, the first quarter ended with the Panthers up 7-0. The Panther defense denied the Blue Devils’ offense at the start of the quarter and forced them to kick a 25-yard field goal to cut the Panther lead to four, 7-3. The rushing attack carried the Panthers’ offense on their next possession, but the drive stalled at the Duke 29-yard line. First-year Alex Kessman missed a 47-yard field goal to keep the score at 7-3. Duke quickly punted the ball back to the Panthers with 2:40 remaining in the half. DiNucci and the Panther offense worked their way into Duke territory, but the Blue Devils stopped the Panther drive at the Duke 37-yard line. Kessman missed a 55-yard field goal with 15 seconds remaining in the half. After two big plays, the Blue Devils moved into field goal range with four seconds remaining in the half, but the Panthers blocked the Blue Devils field goal to end the half with a 7-3 lead. To start the second half, the Panthers held the ball for over five minutes, but made little progress downfield and punted the ball to the Blue Devils. On the third play of the Blue Devils’ drive, Jones found senior running back Shaun Wilson wide open in the middle of the field for a 58-yard touchdown to give the Blue Devils a 10-7 lead. The Panther offense still couldn’t piece together a drive and punted the ball away in their next possession. The Blue Devils punted the ball right back, but Maddox came out of the game with an injury for the Panthers. After the Panthers couldn’t convert on fourth-and-one, the Blue Devils made the Panthers pay on the third play of their drive. Jones found junior wide receiver T.J. Rahming downfield for a 39-yard touchdown to extend the Blue Devils’ lead to 10 with less than a minute to go in the quarter, 17-7. 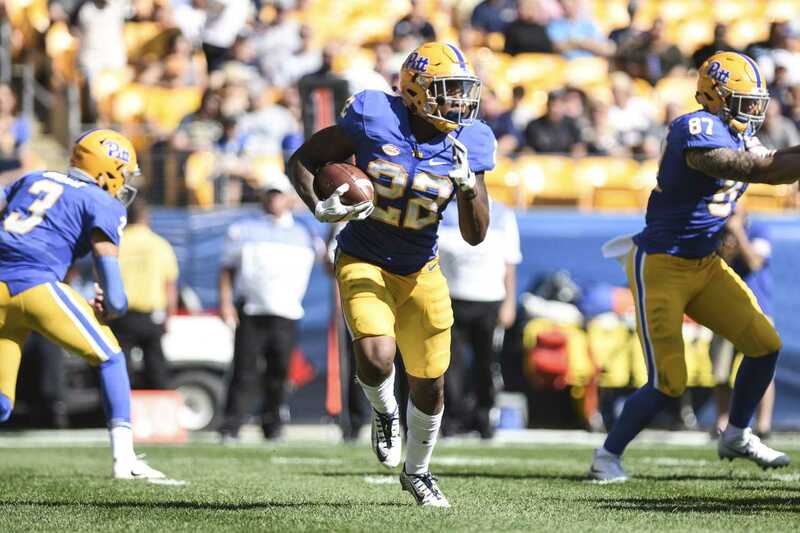 On the first play of the Panthers’ drive, Hall burst through a seam down the middle and outran the Blue Devils’ secondary for a 92-yard touchdown, breaking the record for longest rushing touchdown in Pitt history. This touchdown put the Panthers within one score of the Blue Devils, 17-14. As the Blue Devils started their next offensive possession, the third quarter ended with the score remaining 17-14. Beginning the fourth, the Panthers forced a quick Blue Devils’ punt, and Pitt finally found some success through the air in their next drive. DiNucci connected with redshirt senior Jester Weah for over 74 yards throughout the drive, and Hall punched in his third touchdown of the day to give the Panthers the lead, 21-17. Jones and the Blue Devils responded and drove into Pitt’s red zone, but a sack from redshirt sophomore Dane Jackson forced a field goal attempt. Redshirt sophomore Austin Parker missed the field goal, keeping the score at 21-17. With less than seven minutes left in the quarter, DiNucci and Hall led the Panthers down the field but were forced to kick a field goal. Kessman drilled a 45-yard field goal to put the Panthers up 24-17 with 1:41 remaining in the quarter. The Blue Devils worked their way to the Pitt 29-yard line through the air, but junior defensive back Jordan Whitehead intercepted a deflected ball to give the Panthers possession with 45 seconds remaining. Three kneel-downs from DiNucci ran out the clock and secured the 24-17 win for the Panthers — their first in the ACC this season. The Panthers will return home next week as they take on the Virginia Cavaliers in a 12:30 p.m. matchup at Heinz Field.